Banana Ketchup! If my information is correct this sauce is the result of the tomato scarcity during war. The filipino population who were fond of tomato ketchup were challenged to find alternatives. 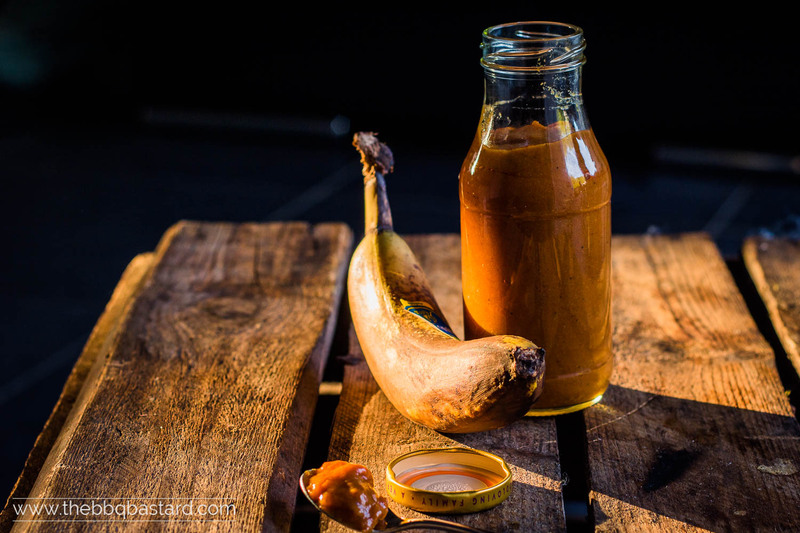 Resulting in this crazy idea: Banana ketchup… Sounds pretty interesting doesn’t it? Especially knowing this is an excellent idea to help you out with some leftover overripe bananas! Say bye to foodwaste! The browner the bananas are, the sweeter and more delicious your sauce will taste! Would you give it a try? I did! After reading a recipe for this sauce in a book called “saté and beer” (dutch only) I wanted to give this a try. We often have overripe bananas and I hate to throw food away. So why not… Honestly the recipe was a disaster… It was to spicy, so I made my own twist before sharing it with you. It still ain’t a ketchup I would serve cold, but I’ve tried it on burgers with a lot of fried onions and marinated some porkchops in the sauce in another session! Both were tasting pretty interesting so here you go! I’m curious what you think about this recipe. 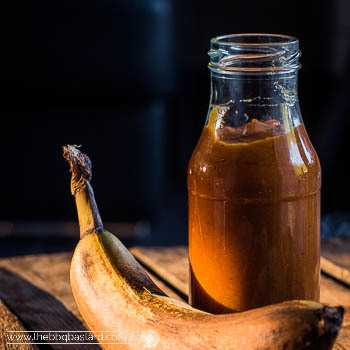 So please let me know if you’ve tried this banana ketchup recipe, especially when you’ve tasted the real deal! I’m curious to compare the sauces cause this banana ketchup doesn’t taste like ketchup at all. I don’t even know if it’s supposed to be! Anyway … I had a great time experimenting and hope you feel the same about it! If you’ll skip for these, take a look at my other sauce recipes. They might taste a bit more familiar than this one. Cheers! In times of shortage people get creative! During war the tomato import got stuck causing a disaster for the ketchup loving nation. The overload of bananas lead them to be creative! The banana ketchup was born! Are you curious how it tastes? Add a tbsp of oil to a cast iron pan and toss the shredded red onion, freshly grated ginger and finely chopped red peppers in the pan. Put it on a medium fire to fry the ingredients. While frying the onion, add all other ingredients to a blender and blend them until you've obtained a smooth sauce. Add the yellow banana ketchup sauce to the fried onions and let simmer for an hour on a low heat fire. Stir every once a while to prevent the sugars in the sauce from burning. If the sauce is thickening too fast, add some more water. Taste your banana ketchup and add some more ingredients at taste. Pour the sauce through a strainer to remove the onion, pepper and ginger if you want a smooth sauce and pour it in a clean bottle. I don't mind for pieces in my sauce and prefer the sauce with fried onions inside of it. Have fun with this special tasting sauce!